This Savage Song is a novel about monsters and a city on the brink of being overrun by them. Verity is split in to two cities North and South. The wall that separates the different sides though is crumbling and there are forces both outside and inside the city that can’t wait for it to fall. This Savage Song has two main characters Kate and August. Kate is the daughter of Callum Harker, the crime boss of North City. Humans pay for medallions and in exchange they receive her father’s protection. Kate is just returning to the city after being exiled to boarding school. She has a thirst to prove herself to her father. She wants to show him she can take over the family business. This made her hard to like. Throughout the first half of the book I didn’t really like her, but I don’t think you were supposed to. Kate doesn’t want you to like her. August is one of the monsters in Verity. He is a rare Sunai and was adopted by his “father” who is in charge of South City. August was really a monster trying to find his humanity. He wants to just fit in but being a Sunai he knows he never will. August was my favorite character in this novel. He just exudes this genuineness that you can’t help but like. I’m sure you’re now saying TELL ME ABOUT THE ROMANCE. Well, there isn’t any. August and Kate can barely even be called friends through much of this novel. It wouldn’t have been natural for them to become romantically involved. They both have a lot going on internally that they aren’t ready for a relationship. I’m interested to see if this will change in the next novel or if they will simply remain friends. Because I like a dose of romance in my YA I’m hoping that if August and Kate aren’t a match they will find someone who is. My biggest problem with this book was that it felt like a disproportionate amount of time was spent on world building. At a certain point I got tired of all the world building. Don’t get me wrong, I don’t like it when authors cut corners and get sloppy with world building. But, it felt like things were added to clarify something that should have just been described clearly. Once. Overall, I enjoyed This Savage Song. It was original and I liked Schwab’s interpretation of monsters and what it means to be human. Were there things I wasn’t too keen on? Yeah. Will I be reading the sequel though? Definitely. I need to know what happens to August, Kate, and Verity! 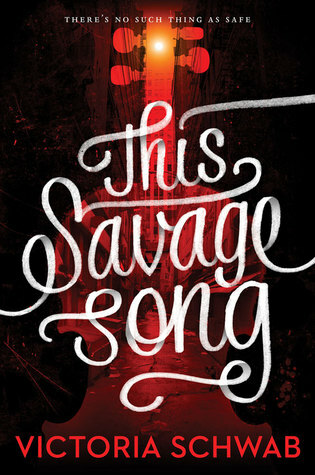 I haven't read anything of Schwab's yet but I'm interested in This Savage Song! Like you, I like romance in the books I read. I don't think I'll be getting to this anytime soon, but I'll definitely be reading it eventually.